One primary area power of attorney forms are used for is finances. You can have your attorney in fact perform a wide range of financial duties for you. These include real estate transactions, personal property transactions, business management, collecting military benefits, insurance transactions, and almost any other matter you can think of. For example, you can authorize the agent to sign orders to buy products from a corporation you do business with, or you can authorize him or her to sign checks to pay your bills. These documents are flexible, so you can authorize broad powers in the event you become incapacitated, or you can assign only a small number of powers for a predetermined period if you are going on vacation and will not be able to attend to your business. In Rhode Island, you must specify on the form that the power is durable. If you do not, the form will lose effect if you become incapacitated, which defeats its purpose in some cases. 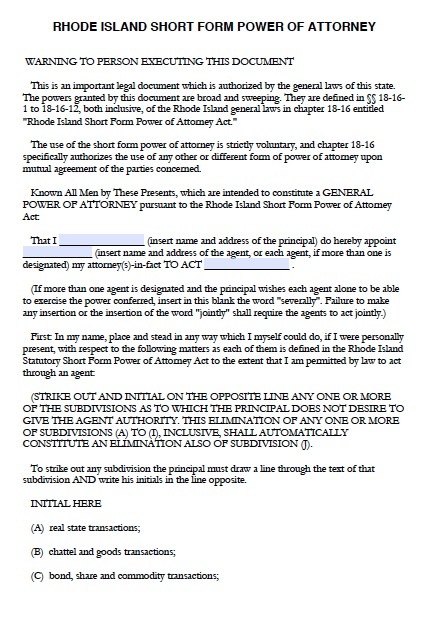 Rhode Island requires that two witnesses or a notary public sign your form.